Cashvilleonline slots casino game was launched in 2005 and has endured in popularity since. The reels are full of colourful and gaudy symbols of rich pickings and are so big there is no background. It’s all about the silver and the gold. Cashvillehas a 5 reel, 3 row, 20 payline format. There are no usual playing cards in this game. At the bottom end of the paytable there are several different cash stashes, the first is Betty Boodle’s purple stash with her pearls, the second is Sir Sterling’s pile of cash and coins, the third is Dame Von Deed’s notes and ring and the fourth is Bill Bullion’s wadge of cash and cigar. At the top of the paytable are the four millionaires – Betty Boodle, Sir Sterling, Dame Von Deed and Bill Bullion. Click the three lines and select Paytable to view the paytable andclick Help to view the rules. Select the number of lines you want to bet on (from 1 to 20) and then select your coin level (from 1 to 10 and coin value (from 0.01 to 0.50). You can click Bet Max if that’s how you want to play but be aware that clicking Bet Max will perform a spin automatically. You can play auto by clicking Expert and then selecting a number of spins and clicking Start. If you want to stop autoplay just click the stop button. Triggered by three or more scatters, you get to pick a billionaire to play a bonus game. The number of scatters you spun determines how many picks you get in the next step of the game. If you pick Betty Boodle, pick from her dog portraits to win a prize. If you pick Sir Sterling, pick from his vaults to win a prize. If you pick Dame Von Deeds, pick from her deeds to win a prize and if you pick Bill Bullion, pick from his oil rigs for a prize. After a win you can choose to gamble your win by selecting a red or black card to double or lose your win. 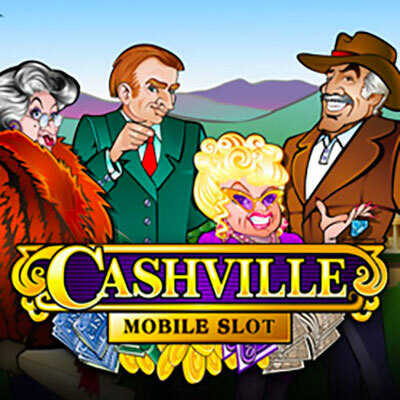 Cashville online slots is a fast spinning, no-nonsense slots with rich symbols and good bonus offerings. It may look dated compared to the high resolution graphcis in slots today but it is a classic game.